Crossroads for Florida Kids would like to thank all those who contributed to us this past year. We could not do what we do without your generous gifts and support. Congratulations to our Attorney’s Stephen Todd and Rosemary Armstrong for their services awards in 2018. Crossroads For Florida Kids Pro Bono Attorney and Guardian ad Litem volunteer Stephen Todd won the Supreme Court’s Tobias Simon Pro Bono Award, the most prestigious statewide honor for pro bono service. 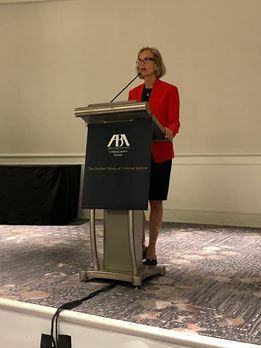 Crossroads For Florida Kids Executive Director and Pro Bono Attorney Rosemary Armstrong won the American Bar Association’s Criminal Justice Section’s Livingston Hall Juvenile Justice Award. This national award recognizes an active member of the bar who devotes a significant portion of his or her legal practice to youth and children, and is making positive contributions to the field both in and outside the courtroom. Our Crossroads for Florida Kids training instructor is conducting a free training program on Independent Living Benefits. Florida offers a variety of assistance to young adults who were formerly in Florida’s child welfare system. The eligibility requirements vary by program, and small changes in a teen’s status can have a big impact on their eligibility for future assistance. This training will review the benefits, the eligibility requirements, and advocacy strategies for helping young people get off on the best foot possible. Who Should Attend: Attorneys who represent children, other attorneys, caseworkers, GALS, and anyone interested in ensuring that young people have a say in their future.